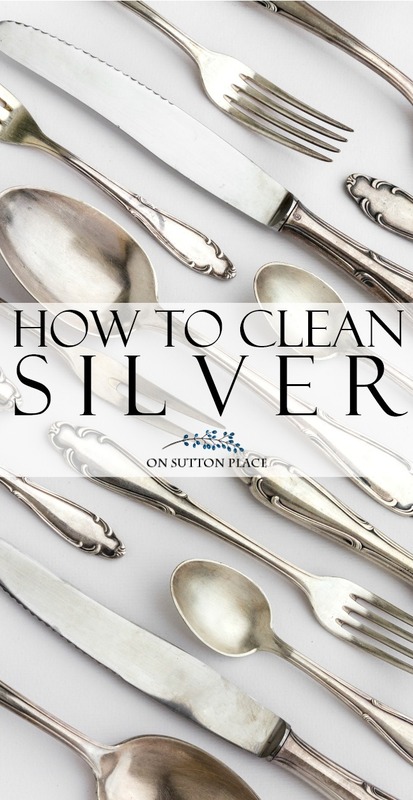 Here’s an easy and quick method that shows how to clean silver naturally and in about 5 minutes. Use to clean silverware, serving pieces & more! Place a piece of aluminum foil at the bottom of your kitchen sink, and fill the basin with HOT water. Add 1/2 cup kosher salt and 1/2 cup baking soda. Swish the water around until the salt and soda are dissolved. Drop your silver pieces into the water. Allow your silver to soak for 3 – 5 minutes. Buff dry with a soft towel or cloth. Pictured below is the first urn halfway through the cleaning process. When I rolled it over, I was amazed at how quickly the tarnish and dirt had been removed. Use more salt for larger pieces, as you will need more water and a longer wait time. Loosely wrap the silver pieces in foil before you set them in the basin. Use toothpaste on a soft rag to clean stubborn spots and streaks. Badly tarnished silver may need to be soaked a second time. 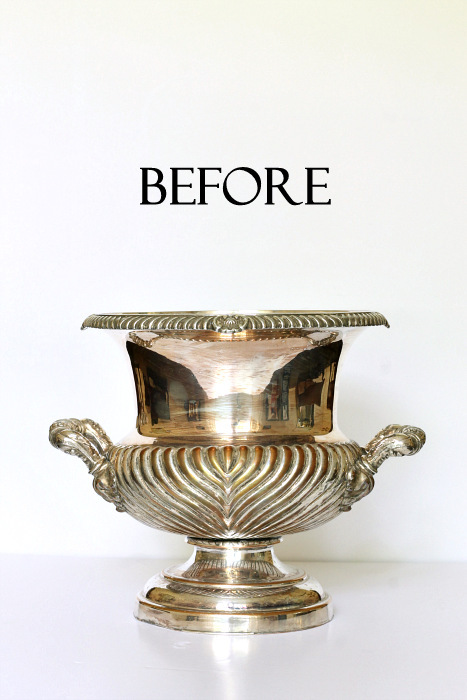 I changed the foil and bath after the first urn but if your pieces aren’t badly tarnished, I think you could do more than one piece at a time. My kitchen sink has 2 sections, one bigger than the other. I used the small side which measures 15 x 12 x 6. If your sink is larger I would recommend using more salt and soda. This method is for cleaning only. It doesn’t polish silver…but I’m not sure that’s even necessary. 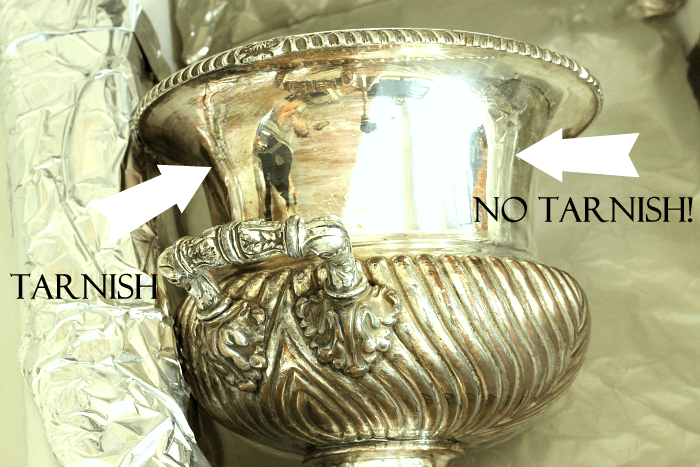 Polishes have chemicals and I read that sometimes silver tarnishes faster when it’s polished. I have no idea if that’s true or not…I only wanted to share the information. Learning about this process has enabled me to bring my silver out of hiding. For years and years, I didn’t use it because I didn’t have the time to clean it. Now I can easily maintain it so it can be used and enjoyed. Click HERE for my disclosure statement. Click to visit the OSP Amazon Shop! Does this work for silver jewelry? Hi Michele…yes it does. However, if it’s valuable jewelry, I’m not sure I would try it. I’ve cleaned my silver jewelry with a soft tooth brush and a baking soda paste. That works very well too. Doesn’t matter what kind of salt you use – it dissolves in the hot water. I’ve used this technique for smaller pieces, and just put them in a disposable foil pan, which can be reused for future cleanings. I add white vinegar after putting the silver in the hot water, baking soda, and salt mixture. 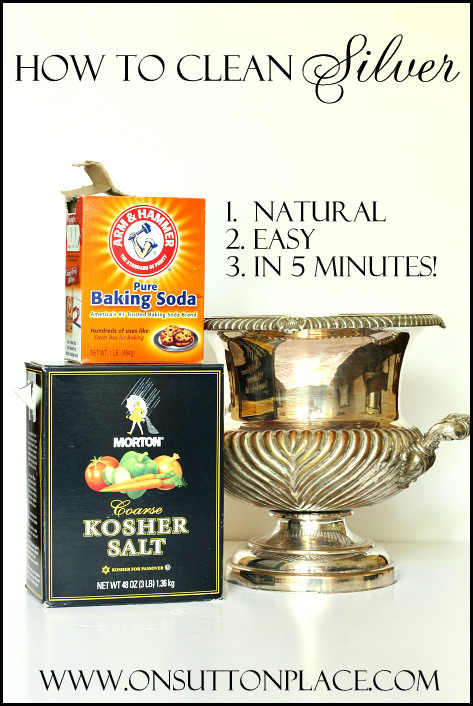 The vinegar and baking soda bubble up – and the tarnish disappears. Love it! This is brilliant! Thanks for the great tip! Thank you for sharing these helpful tips(: I’ll use them to clean my sister’s trophies. Just one question, could I use sea salt? I’m not sure about using sea salt. The kosher salt is very course and may remove the tarnish better. You could try but it may not work as well! Perhaps I should clean my silver, I love it tarnished, but it looks so lovely when it’s shiny and new looking. 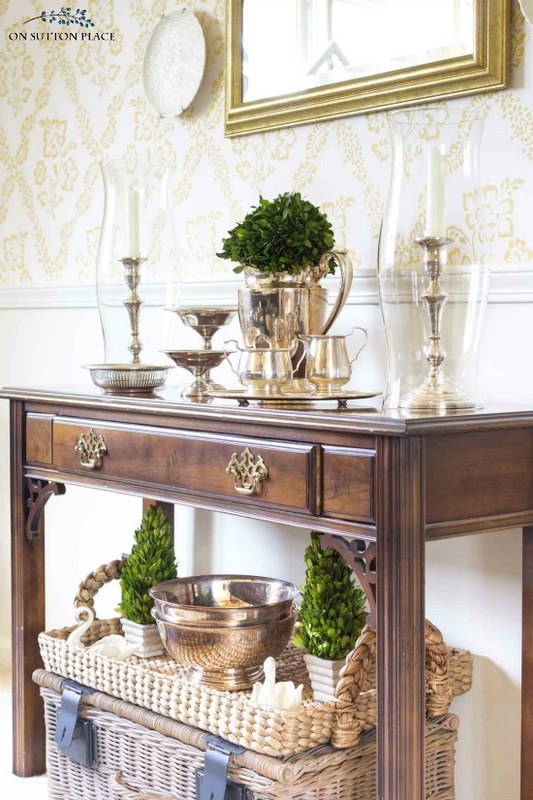 Do you have any information on how to clean brass with natural ingredients? Strong chemicals make me sick and I have not been able to find anything that works. HELP, PLEASE! I think the best way to go about cleaning your brass is to use baking soda and vinegar. Pour a little vinegar into a bowl and add baking soda until it makes a paste. Rub it on your brass until the tarnish is removed. Rinse and buff it to get the shine back. One other idea is to use ketchup. I know that sounds odd but it is acidic which is what you need to remove the tarnish. Squirt some ketchup on a dry rag clean and rub on your brass. Rinse and buff. I hope one of these ideas works! This is such helpful info! I have a ton of silver to clean. Thanks! Wow, Ann. I will gladly toss the hideously smelly, full of chemical cleaner in my cupboard. This is brilliant. This sounds so good I am going to have to give this a try. I have my mothers silver and I love using but like everyone I know I can’t stand polishing it when needed. I’ll see how this works. I will have to try this again, I did try the baking soda/foil with NO luck~but perhaps my silver was too tarnished! I actually chalk painted some candlesticks I couldn’t clean and they look great now! 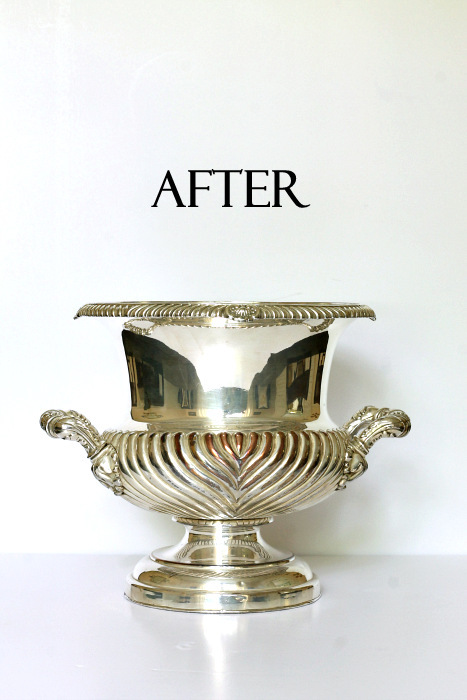 Your urns look lovely, just like new! I have been reading about the tin foil method and want to try this. I have 3 handmirrors that need cleaning,but I am hesitant to put them in the liquid because I am afraid it might hurt the mirror glass. I guess the ony way to see if it will is to try it. Thank you Ann for the information. Have a great weekend. Thanks so much, Ann. The urn turned out fantastic! I recently used the foil/baking soda and it didn’t really clean up the tarnish on my silverware but actually added a nice shine. I’m going to try this. I’m a little worried about doing it in my sink though, I used a large pan…I didn’t need a lot of depth. My sink is porcelain, can the tarnish harm it? I’m honestly not sure about harming your sink. My sink is acrylic and it didn’t do a thing to it. I almost wish it had so then I could justify getting a new sink. Ha! The water after cleaning was dirty and the foil becomes sort of discolored. If you are really worried then a large pan would be the way to go. Thanks for your comment! Thank you so much for sharing, Ann! 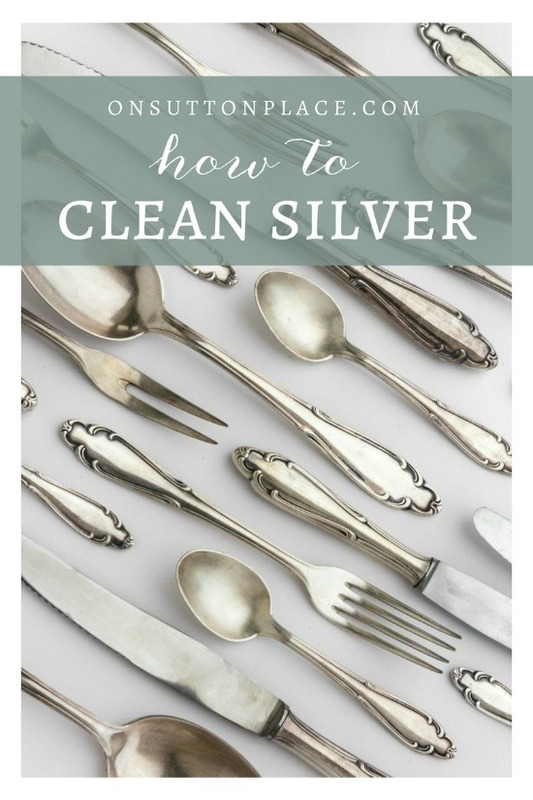 I’m going to give this a try next week… my silverware is desperately in need of a cleaning! Great tips Ann! 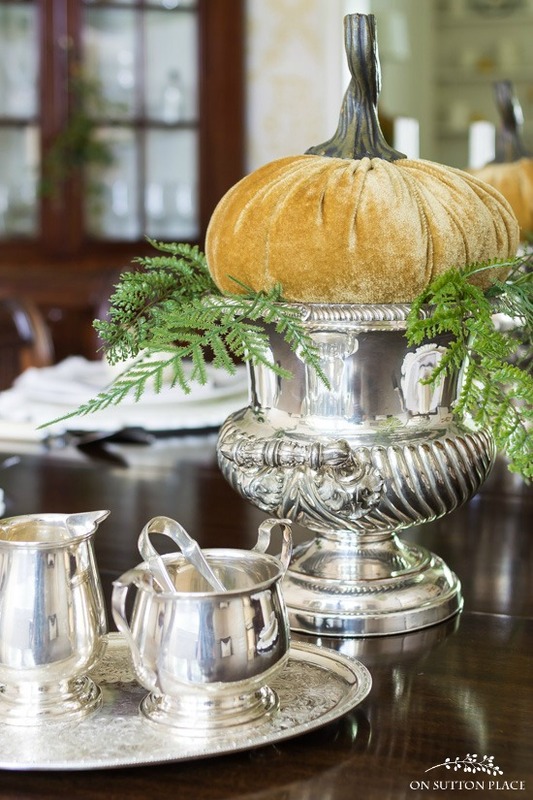 Your silver urns are just beautiful!